This is a timer app for people that take timing seriously. It's flexible intelligence combined with a simple interface make it perfect to countdown simple tasks or more complex procedures. All Timer covers everything you would ever need in a countdown app and introduces a set of unique features. Tasks can be used as building blocks to create more complex sequences called Groups. 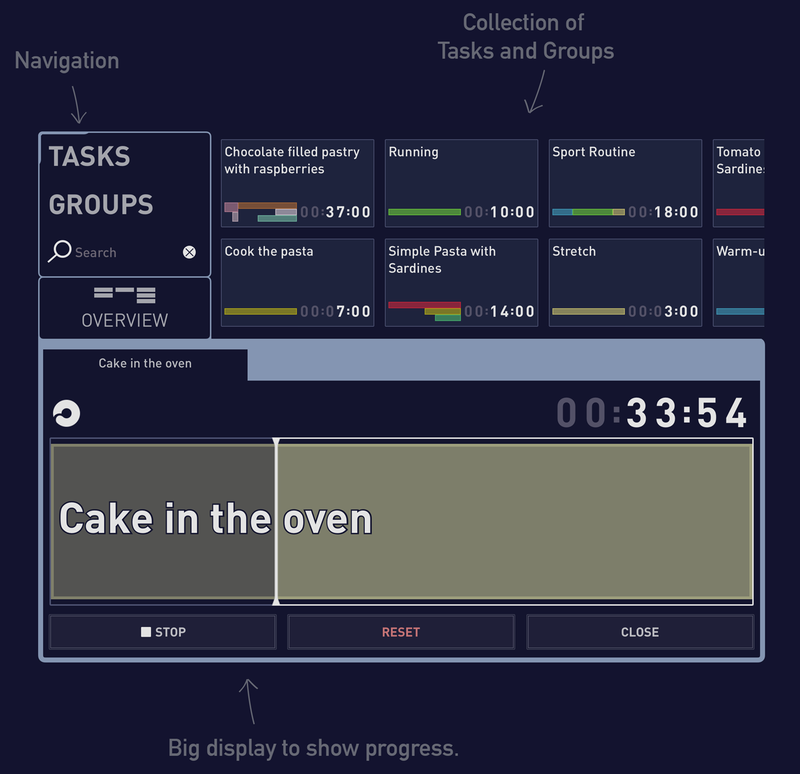 In a Group several Tasks can have the same start time, the same end, or are positioned serial. A Group can contain other Groups (!) and this makes All Timer so powerful because it provides endless possibilities. You can mix and combine and perfectly plan whatever you want. 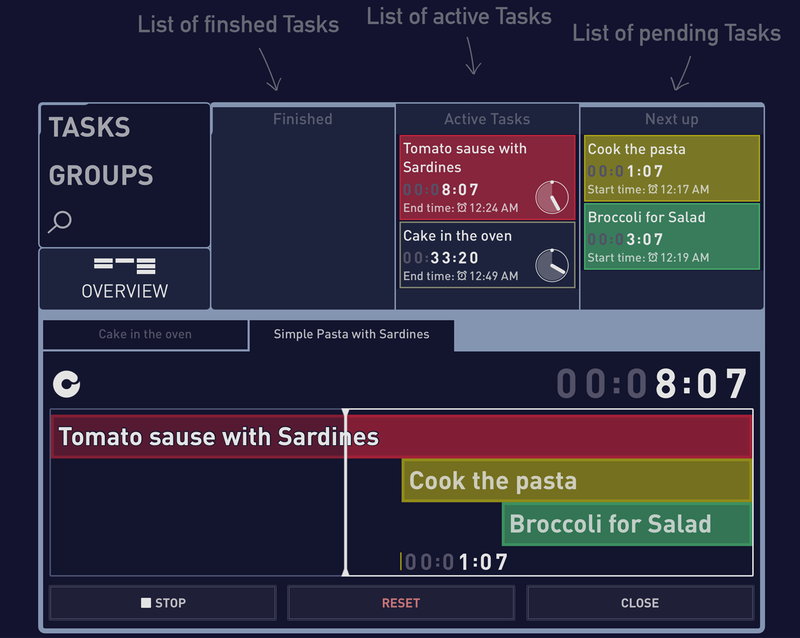 The OVERVIEW will show all Tasks and the corresponding time to start or finish. This makes it easy to see what needs to be done and when. No matter how many processes you've started! Please note: the Task "Cake in the oven" is also visible in the OVERVIEW. And surely: when a Task is finished or started you will be notified with an ALARM sound. This sound is specifically designed for All Timer to be recognizable and cut through noisy environment. "It is impossible to tell you how many problems this app solved for me. And works perfectly." Smooth and clean interface, easy to use. App will remain active as long as Tasks are active (screen not dimming). Start as many Tasks and Groups as you wish simultaneously. You will be notified with an ALARM sound specifically designed for All Timer to be recognizable and cut through noisy environment. You will be notified even when you are using another app, or your iPad is locked. Languages: English, Dutch, French, Portuguese, Spanish, Japanese, Korean, Simplified Chinese. Create same-begin / serial / same-end Groups and combine whatever you need. Possible to add Tasks and Groups to a Group to create anything imaginable. This app was made as simple as possible. There are no settings and you can navigate with simple taps. contact us or leave a message on our Facebook page.